The monument, which honors soldiers from Fitchburg, Mass., who died in the Civil War, was erected in 1868. 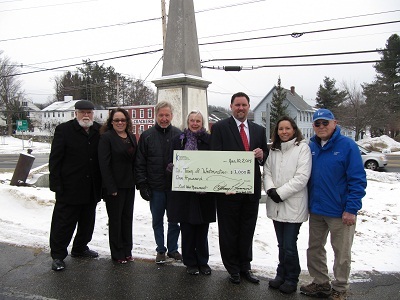 Pictured in front of the monument are (from left to right): Westminster Historical Commission Member Tom Connell, ICFCU Westminster Branch Manager Nicole Vassallo, Historical Commission Member William Waight, Historical Commission Member Roni Beal, ICFCU President/CEO Tony Emerson, Historical Commission Member Laurie Tarr-Ellsworth and former Westminster Postmaster Stanley Skamaryzc. The Westminster Historical Commission is undertaking the restoration of the Civil War Monument and its neighbor, the $500 million IC Federal Credit Union, was the first to step forward with a $1,000 donation.